I wasn’t sure what to expect. I’d never seen so many Sea-Doo watercraft together at one time. Many different models and model years were represented in that PWC fleet. Certainly their operators were a varied cross section of families, couples and solo riders of all ages and genders. Lots of kids too. On the water, this armada stretched out for what seemed like miles, Sea-Doo’s as far as my eye could see. It reminded me a bit of some of the motorcycle ride-in events I’ve attended, bikes filling highways and camaraderie filling hearts. Other boaters gaped at our impressive watercraft parade as we cruised by on that bright, sunny morning, off to ride our designated route. This was my first Watercraft Ride For Dad. When I’d arrived, Sea-Doo watercraft were moored at every dock and more were coming in from the river. Riders milled about on land, socializing and joking as they waited to register and hand in their pledge sheets. For many, the Watercraft Ride For Dad is an annual event. It’s a fun PWC outing that raises money to battle prostate cancer, the most common form of that disease among men. As far as I know, these Ontario rides are the only annual PWC fundraising activities of their kind. It’s a worthy cause. What’s more, Watercraft Rid For Dad is also great fun for everyone. PWC riders come from near and far to participate. They come for the poker run and prizes, but the bonus is some incredibly beautiful scenery on #ontariowaterways. Watercraft Ride For Dad also offers a unique opportunity to renew old acquaintances, make new PWC friends and connect with new riding buddies. Plus, it’s ideal for checking out other Sea-Doo models and owner opinions. I was able to cage a quick demo from the owners of several models I’d always wanted to try. At the post-ride bar-b-que lunch, everyone was pumped by their experience – there were lots of laughs and some good-natured ribbing of one passenger who’d taken an unexpected and ungainly dunking. Many participants were already chatting about getting together soon for more rides of their own. It’s not too late to hook up with a Watercraft Ride For Dad this summer for your own dose of Sea-Doo fun on the water. There’s one on the St. Lawrence River on Saturday, August 9 out of Morrisburg, and another at 1000 Islands on Saturday, August 23 out of Ed Huck Marine near Rockport. 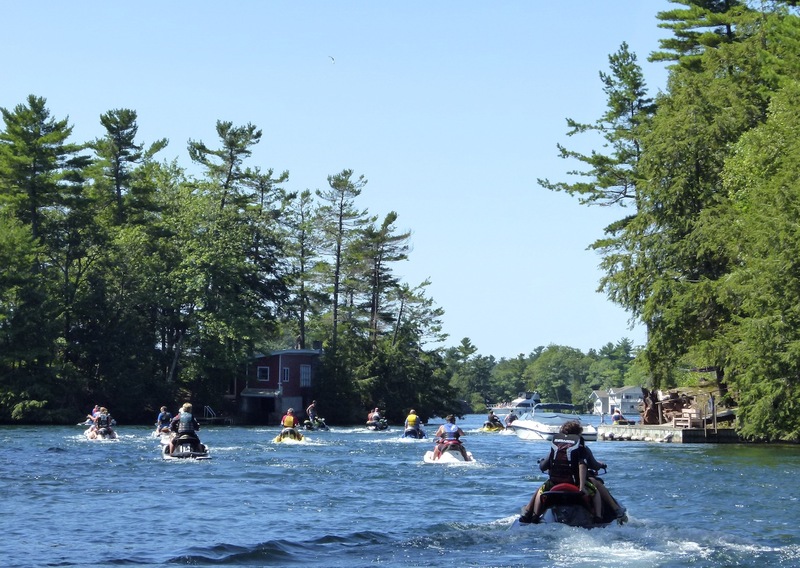 Take it from The Intrepid Cottager, you’ll really enjoy participating in a Watercraft Ride For Dad! 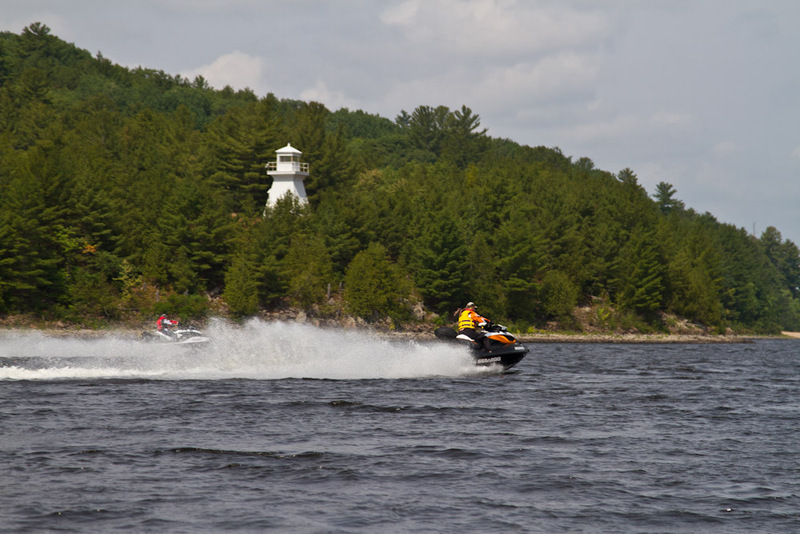 THE INTREPID COTTAGER: Which Sea-Doo is Right For You? 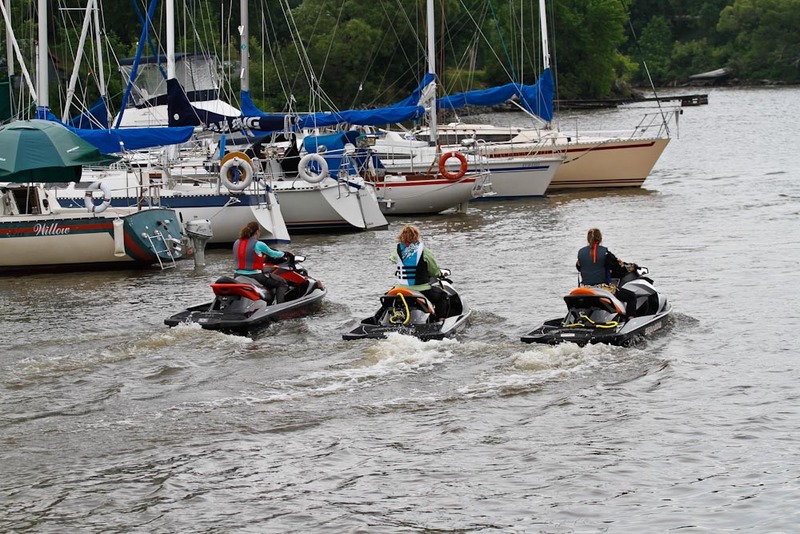 2014 Sea-Doo lineup, choose a Sea-Doo, Sea-Doo watercraft, seadoo, The Intrepid cottager, which sea-doo is right for you? With so many models and prices to choose from, how do you know which Sea-Doo is right for you? In my blog “Sea-Doo Watercraft Buying Tips”, I discussed many of the basic questions you need to ask yourself before purchasing a PWC. This blog deals what model to select and how. Riding Style – This preference offers three options. Here are some descriptive words I’d use to flesh them out a bit (understanding that there will always be some overlap and grey areas among the options): “Playful” – For this lively rider, fun is putting the craft thru its paces, doing tricks, donuts and change-ups, while getting wet (and cooling off) in the process. “Aggressive” – This thrill-seeking rider prefers to conquer the waves at brisk pace with plenty of power, performance, and technology on board. “Relaxed” – For this cruising rider, the main priority is comfort and luxury while touring the waterways to see new sights and go different places. Seating – Choose from one to three seats, depending on how many people will typically ride together on one watercraft. But depending on your age and size, don’t overlook the consideration that a two-seater may always be more comfortable for a solo rider, while a three-seater is roomier for a couple that always ride together 2-up. The choice of seats also impacts manoeuvring and handling: one-seaters are typically lighter and more nimble than three-seaters. Also, be aware that if you intend to legally use your craft, however infrequently for any tow sports, you need three seats: operator, spotter and space for the person being towed. Generally, the more seats you have, the more versatile your new watercraft will be to adapt your changing needs over time. Riding Time – For clarification, Riding Time in this context means how long you ride on each occasion you use your watercraft, not your total riding hours each year (which should be longer overall for those living in warmer climates). To me, the Riding Time choice also speaks directly to Riding Style, above. As a “Relaxed” Rider (albeit with a touch of aggression thrown in for good measure) who cruises for lots of hours, I choose the most comfortable, luxurious and effortless model available. I think most baby boomers should go this way, simply because it’s easier on the bod, regardless of how long you go for. On the other hand, if your primary Riding Style is “Playful”, you’re likely doing a couple of hours here and there on weekends, so your Riding Time may be “Short” or “Medium”, not “Long”. If this is your first PWC, it may be hard to estimate your Riding Time, but if you base your best guess on how many hours you actually have available to spend on the water, you should be fairly accurate. Water Type – This preference is asking for two considerations. One, do you primarily intend to ride freshwater (inland waterway) or salt water (ocean)? Generally, ocean riding tends to involve more waves and challenging conditions, but larger freshwater lakes can be just as demanding. Two, do you intend to ride only in mostly flat conditions but can handle some mild chop if it happens, or are you willing (and able) to ride even if it’s rough? These two considerations will help determine: the size of watercraft you may need (In my experience, larger ones are more stable and handle rough water better. ); and whether or not to get suspension (For cruising and day-trip riding, I wouldn’t ride without it.) Also, remember that if you only go when the water’s flat, your Riding Time may be lower than you originally anticipated. Speed – This preference will help determine what size engine you need. Generally, the bigger the engine and the faster you go, the more gas you’ll use. A “Playful” rider likely doesn’t need as much oomph as an “Aggressive” rider, and a “Relaxed” rider probably falls somewhere in between. I’ve found that for cruising, it’s always good to have a little power to spare. Comfort – Again this preference also speaks to other categories. Comfort is a big factor in Riding Style and Water Type and may also affect your Riding Time. Bluntly, I think it also speaks to age – comfort features and benefits may be a greater consideration for baby boomers than for Gen Yer’s. One thing I know for sure – the longer each ride is, and the more frequently I ride, the more important comfort, especially suspension is to me. So What Am I Riding? I decided to check the accuracy of Sea-Doo’s Selection Preference Tool by entering my own choices. I selected the following preferences: Riding Style – “Relaxed”; Seating – “3”; Riding Time – “Long”; Water Type – “Rough”; Speed – “Somewhat”; Comfort – “Very”. For me, the selection tool recommended a GTX S 155. This selection is right on the money, because a 2014 GTX S 155 is exactly what I had already ordered last spring before knowing about the tool. Equally accurate, by changing my need for Speed preference from “Somewhat“ to “Very” (as in fast), Sea-Doo’s tool recommended a GTX Limited iS 260 instead (what I have been riding for the past two seasons). Actually, my ideal engine size would be a 215cc, but there’s no Sea-Doo model available with that power output with suspension, so this season I decided my wife and I would each ride a GTX S 155 – I’ll let you know how that works out. Meanwhile, if you’re looking for a new Sea-Doo or wonder if the one you have is right, check out Sea-Doo’s Selection Preference Tool for yourself! For more information on The Intrepid Cottager click here. 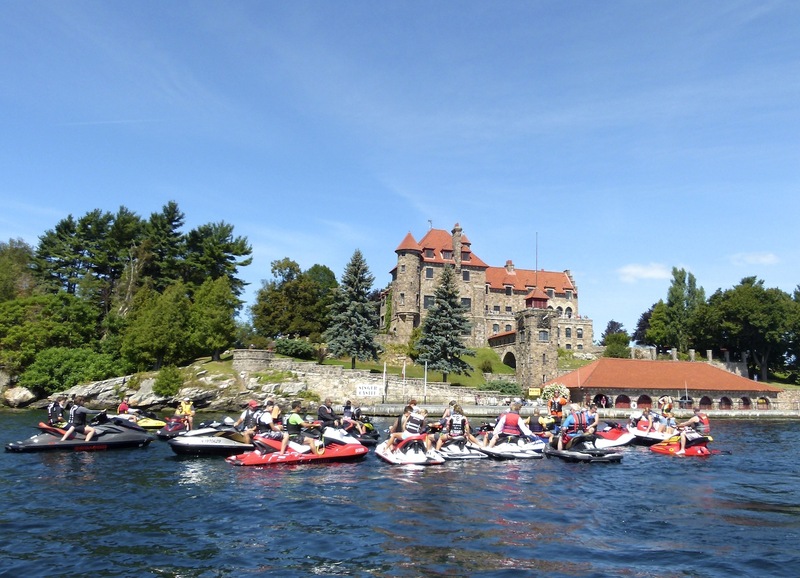 It was a glorious hot summer day, with bright blue skies and sparkling waters on the St. Lawrence River – ideal for PWC riding, and perfect for a fun event. 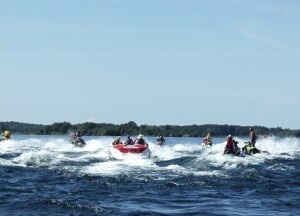 That’s why Sea-Doo watercraft from many model years and of every colour dominated the Watercraft Ride for Dad at Ontario’s world famous 1000 Islands on August 24. If you haven’t been here, it’s a must-visit for Sea-Doo touring! 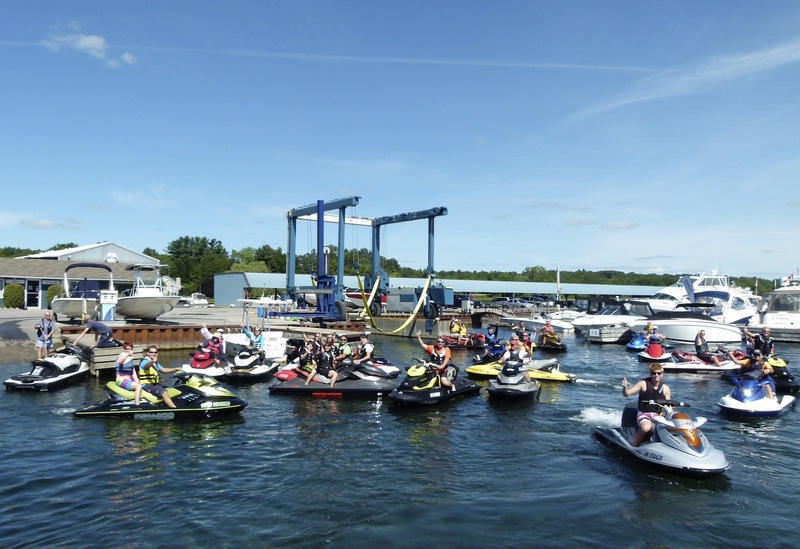 Many couples and families joined solo riders of all ages (including me) on more than 30 watercraft for the launch of the almost three hour ride hosted by Sea-Doo dealer Ed Huck Marine in Rockport, Ontario. Guided by Ed Huck’s Peter Johnston, we explored many of the 1000 Islands, collecting chips redeemable for cards in the poker run part of the event, with prizes worth about $800 up for grabs at the post-ride BBQ. Yes, we ride participants were there to raise money to support the fight against prostate cancer, and our collected pledges totalled almost $6,000. 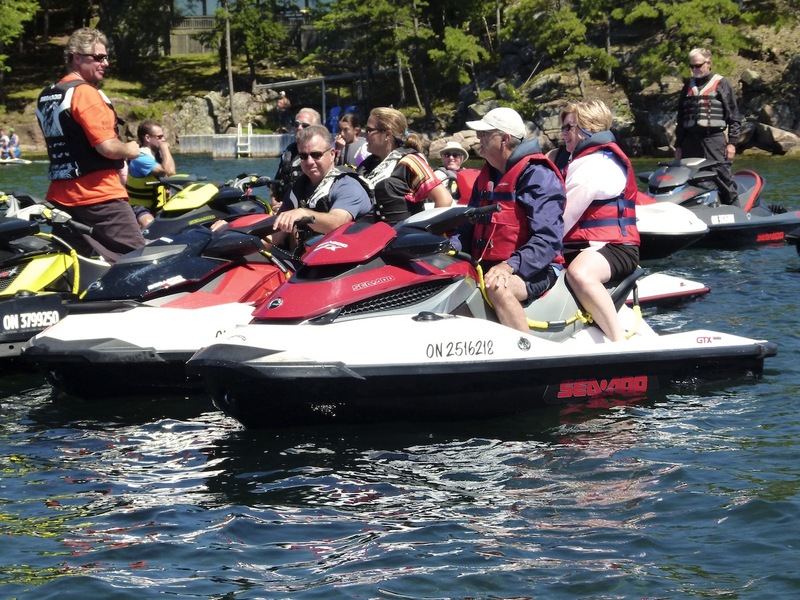 But this Watercraft Ride For Dad is also one of the few opportunities for Sea-Doo owners to meet, socialize, find new riding buddies and go on an organized ride. 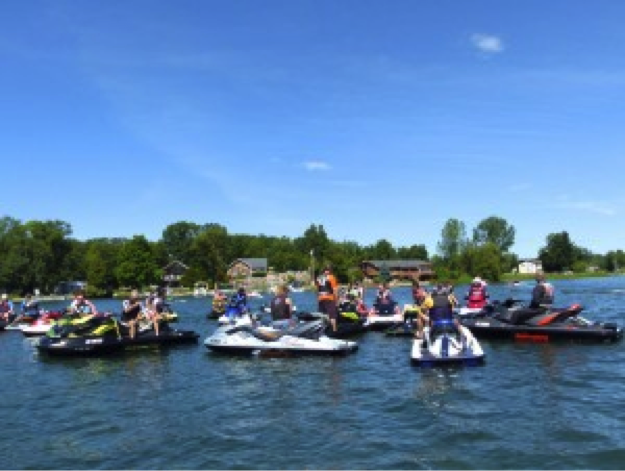 With the growing interest in Sea-Doo touring, many participants were definitely looking to connect with others who want to discover new places. Ride For Dad is a Canadian charity dedicated to saving men’s lives by supporting prostate cancer research and raising public awareness of the disease. Ride For Dad events have been taking place in Canada for over 10 years. What started out as a single motorcycle event and grew to multiple rides across Canada has now expanded to embrace snowmobiles, ATVs and personal watercraft. Today, more than 250,000 men, women and ch ildren have been involved and Ride For Dad has donated more than $9 million towards the cause. That’s the big picture, but we Sea-Doo riders were there to have fun, and I can state unequivocally, “mission accomplished”. What better way to spend a fantastic day on the water for a great cause? Be sure to check out Watercraft Ride For Dad next summer! 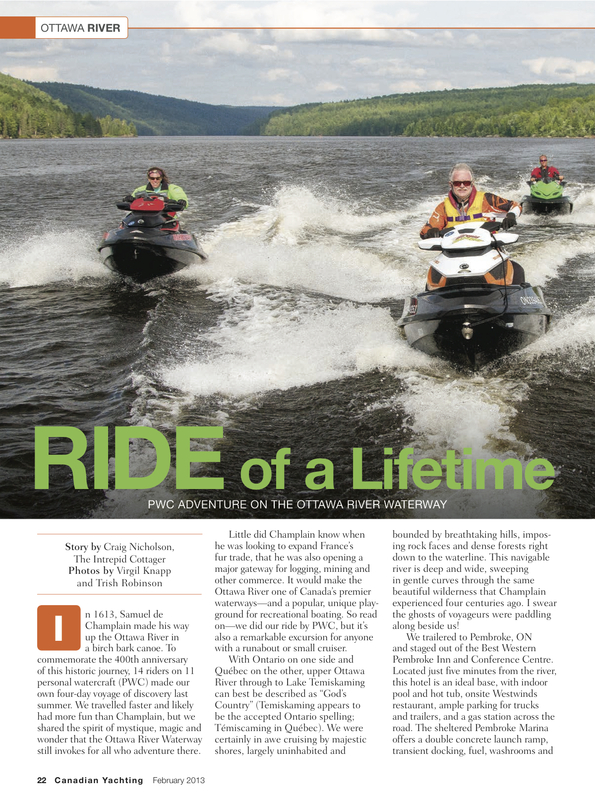 I’ve had many great winter adventures riding Quebec trails on my Ski-Doo snowmobile, and I thought, why not explore La Belle Province in the summer too? 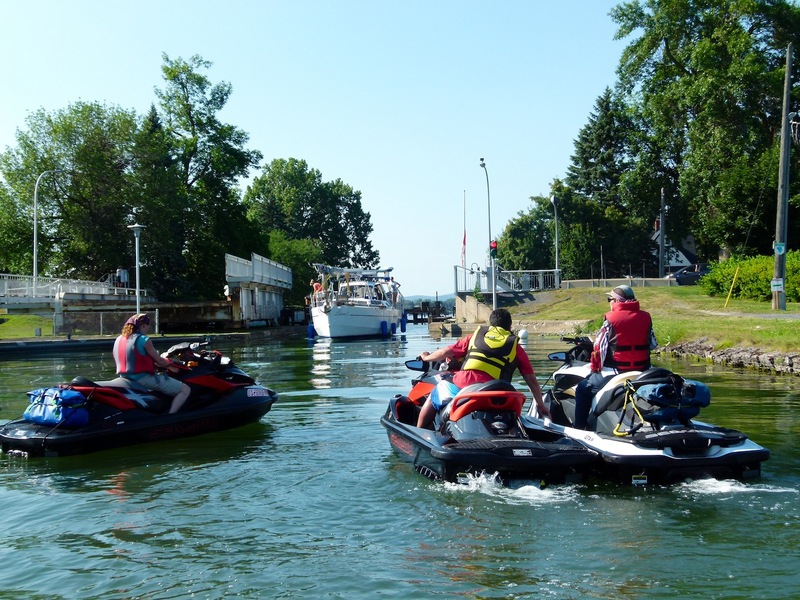 So we trailered our Sea-Doo watercraft to Quebec to launch an 800-kilometre, 5-day Sea-Doo tour of the Richelieu River with side trips to explore Lake Champlain and the St. Lawrence River. Like most Sea-Doo riders, I had many upfront questions about selecting a first-time riding destination. I wanted to know that the waterways were PWC friendly, including good access to shore side fuel, food and lodgings. I also questioned that the daily riding distances were doable and that we had options if we changed plans. 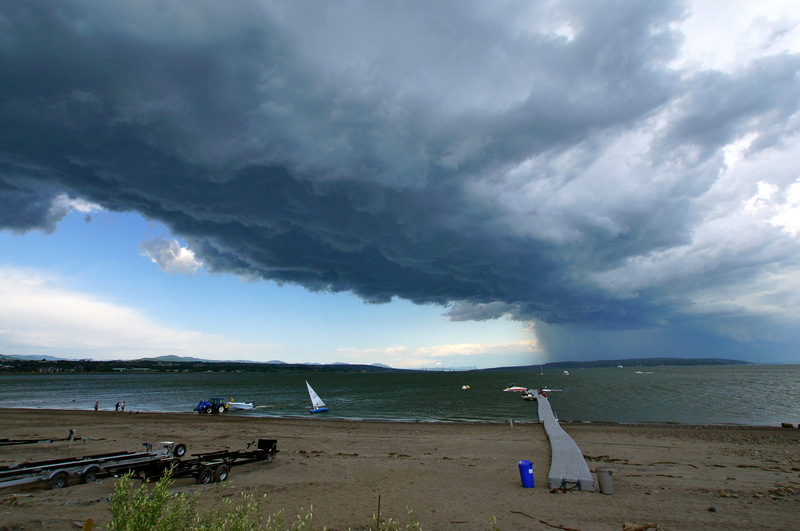 Section #1 – Lake Champlain is about 201 kilometres (124 miles) long and has good water depth. New York State is on the west shore and Vermont on the east. 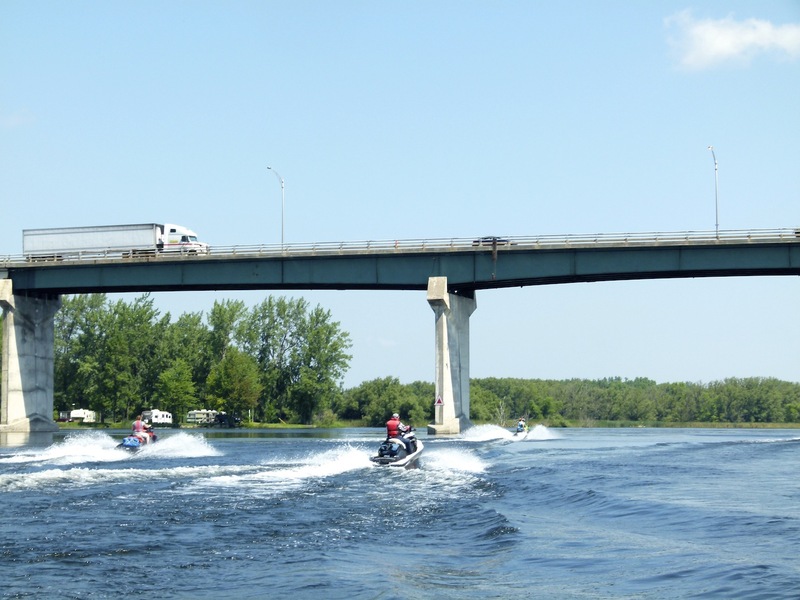 Must-stop ports include Plattsburg, NY and Burlington, VT. Before riding Lake Champlain, Canadians on PWC’s need to check in at the marine port of entry at Rouse’s Point, NY, located at the northwest end of the lake on the north side of the highway bridge. When returning to home, Canadians need to check in at either the marine port of entry at Lacolle (about 1 klick north of Rouse’s Point) or by calling 1-888-226-7277. Americans only have to check in with Canadian authorities if they leave Lake Champlain to ride down the Richelieu. We rode this section on day two. Section #2 – The upper Richelieu River from Lake Champlain to the end of Chambly Canal is about a 55-kilometre (34-mile) ride on calm, easy waters. Be aware that the Chambly Canal is a restricted speed zone for 20 kilometres (12 miles) and includes nine locks and eight bridges that will take at least three hours to pass through. Leaving from Venise-en-Quebec requires another border check in at Rouse’s Point (U.S.) and at Lacolle (CDN). We rode this section on days three and six (repeat border process). 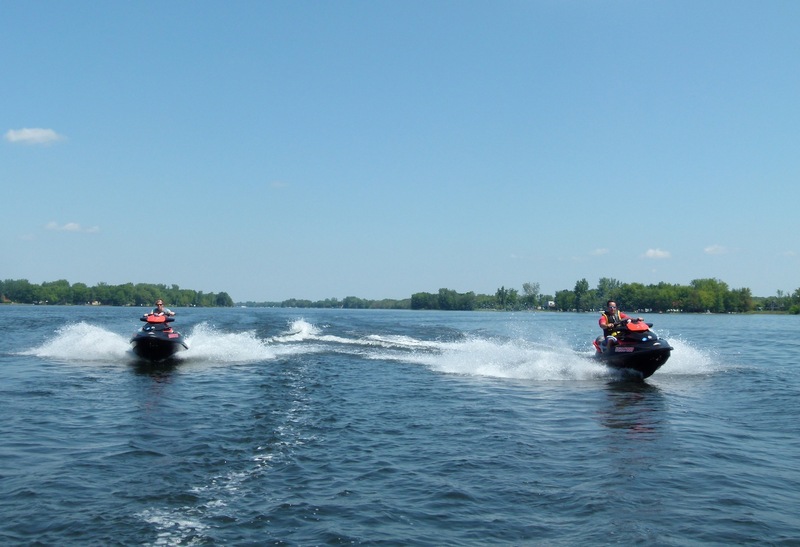 Section #3 – The lower Richelieu River from the Town of Chambly to Sorel is about a 72 kilometre (45 mile) run on faster moving waters because the current really picks up after the canal. There is only one other lock to go through at Saint-Ours. We rode this section on days three, four and five. Section #4 – St Lawrence River northeast from Sorel to Trois Rivières is about 57 kilometres (35 miles) along the main shipping channel on a very wide part of the river. We rode this section on day four. 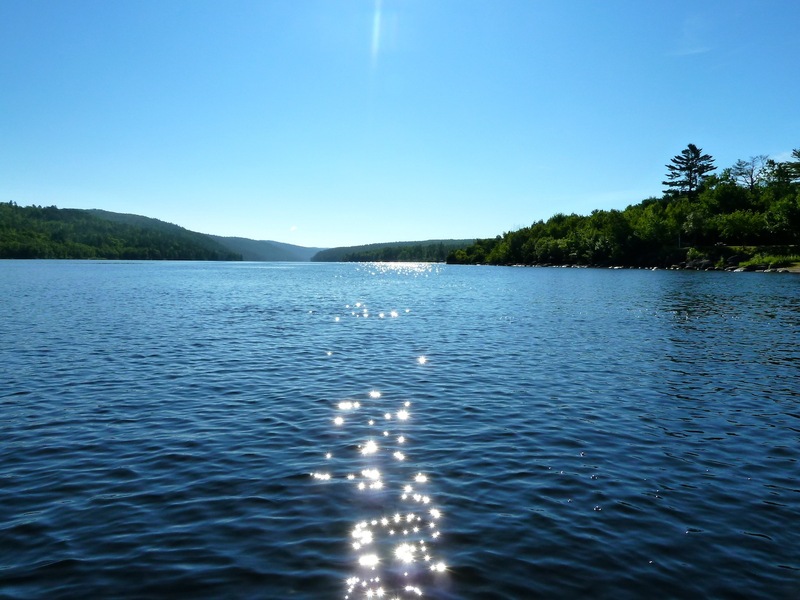 Section #5 – St. Lawrence River southwest from Sorel to Montreal is about 73 kilometres (45 miles) on relatively sheltered channels in a narrower part of the St. Lawrence. We rode this section on day five. Day One – Trailer to Auberge du Lac Champlain, Venise-en-Quebec. Day Two – Ride south on Lake Champlain to Plattsburg, NY and Burlington VT, returning to Auberge du Lac Champlain. Day Three – Ride north on Richelieu River and overnight at Manoir Rouville-Campbell, Mont-Saint-Hilaire. Day Four – Ride north on Richelieu and explore northeast on St Lawrence River to Trois Rivières, overnighting at Auberge de la Rive, Sorel. Day Five – Explore southwest on St Lawrence to Montreal, then ride south on Richelieu, overnighting at Auberge Handfield, Saint-Marc-sur-Richelieu. Day Six – Ride south on Richelieu to Lake Champlain and back to Venise-en-Quebec. Stay overnight at Auberge du Lac Champlain. I’ve toured the waterways of Ontario, Canada extensively on my Sea-Doo watercraft for many years, but I’m still working on cruising all of them. Of the many I’ve already discovered, it’s not easy to pick a top ten. So I’ve applied some basic criteria such as accessibility, good launch, decent parking & services and available fuel. Most are already popular boating routes that are marked with navigation buoys, charted, within cell service and have enough towns, traffic and cottages that help is usually nearby if needed. With a couple of noted exceptions, most are also relatively sheltered routes where strong winds and big waves are normally less prevalent. Generally, this list is set up from least sheltered (10) to most sheltered (1), while the distances are approximate depending on how much exploring you do, so get out there and enjoy! 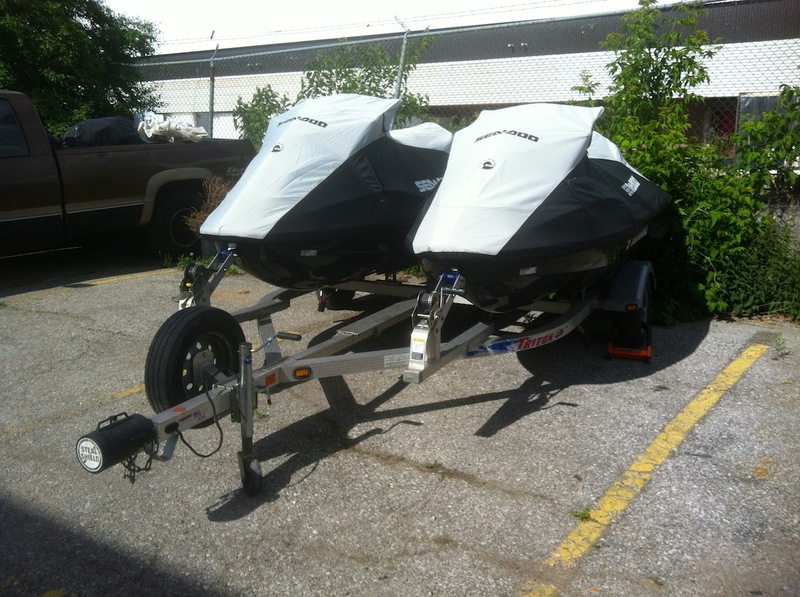 Sea-Doo Dealer(s): Bay Marine, Trenton; Cartronics, Napanee. 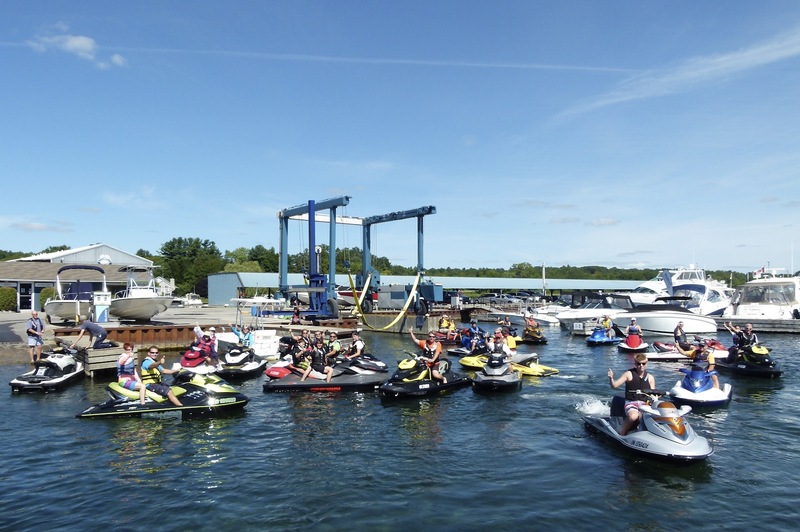 Sea-Doo Dealer(s): Factory Recreation, Midland; The Cove, MacTier. Fuel: Gordon Marine, Gananoque; Ed Huck Marina, Rockport; Brockville harbour. Chrysler Park Marina, Morrisburg. Sea-Doo Dealer(s): Ed Huck Marine, Rockport; Jim’s Performance Plus, Iroquois. Fuel: Bobcaygeon (various); Wychwood Lodge Cottage Resort, Fenelon Falls; various marinas en route. Sea-Doo Dealer(s): Gateway Powersports & Marine, Peterborough; HB Cycle, Lindsay. 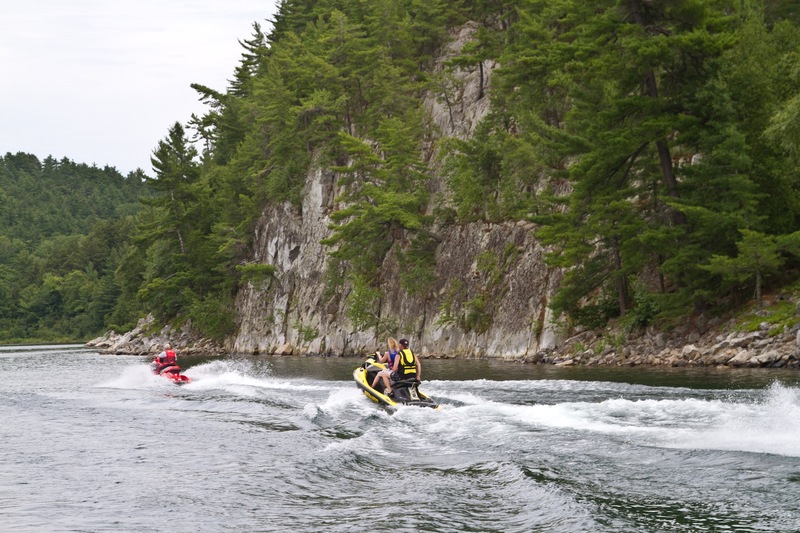 Sea-Doo Dealer(s): The Cove, MacTier; Northland Recreation, Utterson. Sea-Doo Dealer(s): Pete’s Sales & Service, Petawawa. 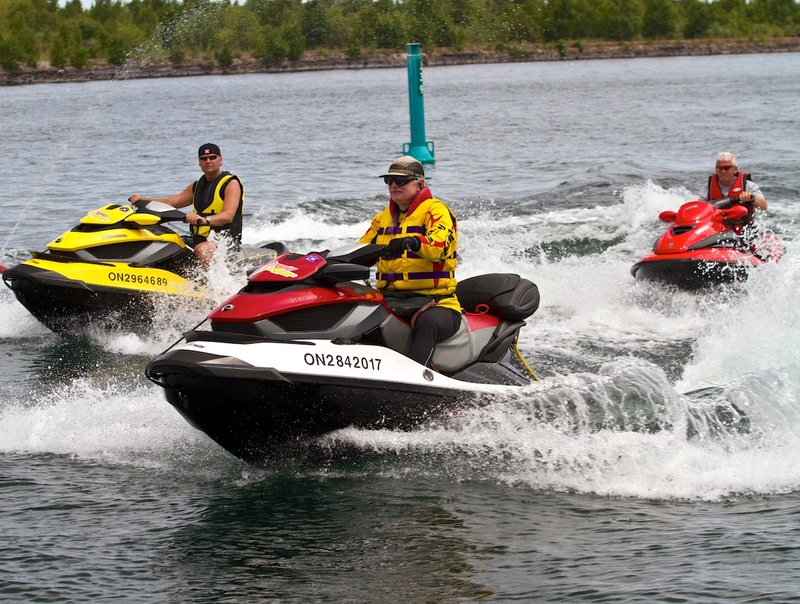 Sea-Doo Dealer(s): St. Onge Recreation, Barrie; Leatherdale Marine, Orillia. 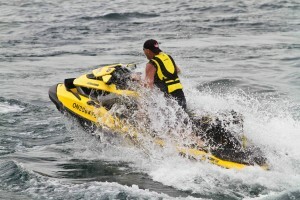 Have you ever noticed that Sea-Doo riders are often the only ones on the water wearing PFD’s? But doing one thing right isn’t enough to earn a reputation as responsible boaters. We share the waterways with many others, including boaters, anglers and cottagers – and we want them to respect our right to be there too. So it’s important for this reason, as well as our own comfort and safety, to brush up on our riding etiquette. Here are a few pointers I try to make part of my riding habits and maybe you can suggest some others. Practice 360˚ Situational Awareness: Unlike roads and trail, traffic on the water doesn’t move in defined linear patterns. That means anything can come at you from any direction at any time, so a Sea-Doo watercraft operator must be constantly vigilant, on the lookout all around, aware of the changing positions of everything nearby and always use rear view mirrors before deviating from your present forward course. Approach Other Boats with Caution: If another boat is crossing your path from your port side (left), you have the right of way. If another boat is crossing your path from your starboard side (right), it has the right of way. Boats approaching head on should each veer to their starboard (right). If you are coming up from behind (from the stern of a boat ahead), you are responsible for keeping out of its way and giving it a wide berth as you pass. Ride Legal: Every jurisdiction has rules for boating. 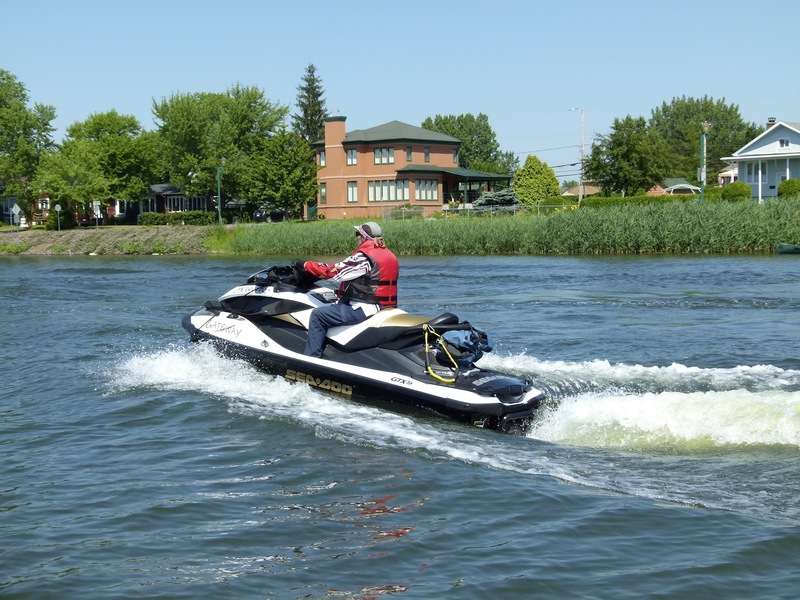 Be sure you know what applies to you while riding your Sea-Doo watercraft on any given waterway so that everything’s ship shape when you encounter marine enforcement. Besides wearing a PFD, legalities are likely to include visible registration numbers, on board safety gear, alcohol restrictions, proper ID and a valid boater’s licence. For more information on your local rules and regulations click here. Obey Signs: There aren’t as many traffic signs or markers on the water as on highways or snowmobile trails, but that doesn’t diminish their importance. There are restriction signs to show areas where you can’t ride or what speed to ride at. Various navigation buoys indicate direction, channel junctions, danger and where the deepest water is. Slow Down in Speed Limit Zones: Like on our roads, there are sections on most waterways where heavier traffic, intersections, narrower passages or shoreline development have resulted in speed restrictions proscribed by law. These restrictions can apply across the whole section of water or only within a certain distance of shore. Slow Down in No Wake Zones: Often these coincide with Speed limit zones, but can also be sections where the large wake generated by a faster moving craft can disrupt or damage shoreline property, docks or moored boats. Avoid Riding After Dark: Your Sea-Doo watercraft does not come equipped with navigation lights, so for your own safety and that of others, avoid riding after dark. Depending on your jurisdiction, riding after dark on a PWC may also be illegal. Be Careful Fueling Up: With our increased environmental awareness, boaters and marinas are tend to be very careful about fuel spills today, so we can do our part by keeping the gas in the hose or in your tank, not on the ground or in the water. Be especially careful if filling your PWC from a jerry can. Respect Other Water Users: From swimmers and divers to anglers, kayakers and tow sporters, many other folks enjoy and share the waterways. As one of the quickest and most manoeuvrable craft out there, PWC riders need to give to all of them a wide berth to avoid scaring, spraying, waving or hitting them. Take Litter Out With You: Many Sea-Doo riders stop to enjoy a water or shore snack or lunch while out for a cruise, so plan how to pack up your garbage and carry it with you to a trash can on land. Use Hand Signals: Although to my knowledge there are no officially approved PWC hand signals, my riding buddies and I use the same ones originally designed for use by automobile drivers to signal one another. These are still used and recognized by many bicyclists, snowmobilers and ATV riders, and include either arm straight up from the shoulder to signal STOP, left arm pointed straight out to the side to indicate LEFT turn, left upper arm raised to shoulder height with forearm pointing up to indicate RIGHT turn. In many instances, keeping both hands on the handlebars is more important for complete control, so we only use hand signals discretionally in reduced speed and traffic situations. THE INTREPID COTTAGER: Start me Up! I’ve introduced enough novice riders to Sea-Doo’s iControl technology that I understand how some folk may be confused at first. 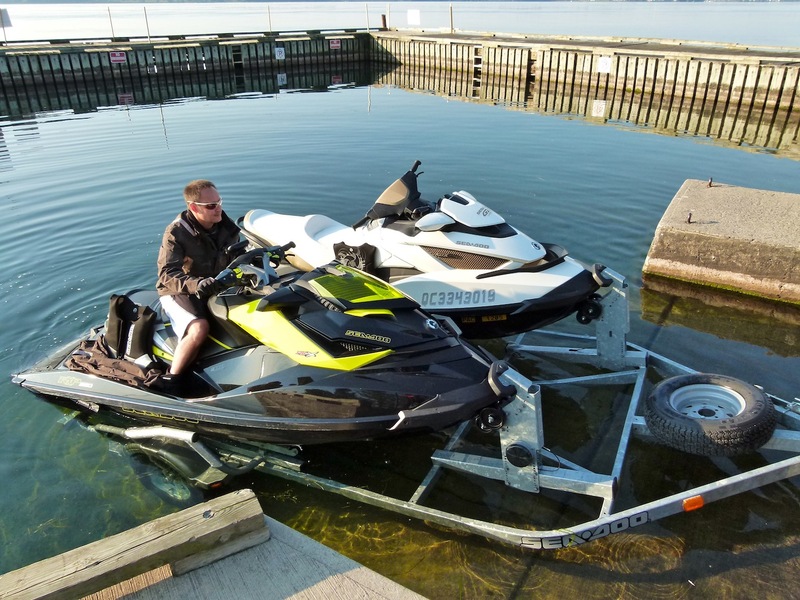 I’ve even heard dealers lament about customers that thought something was wrong because they couldn’t seem to get their new Sea-Doo working properly. 99.9% of the time, the Sea-Doo watercraft was fine. The real problem is that few of us read manuals anymore, myself included. 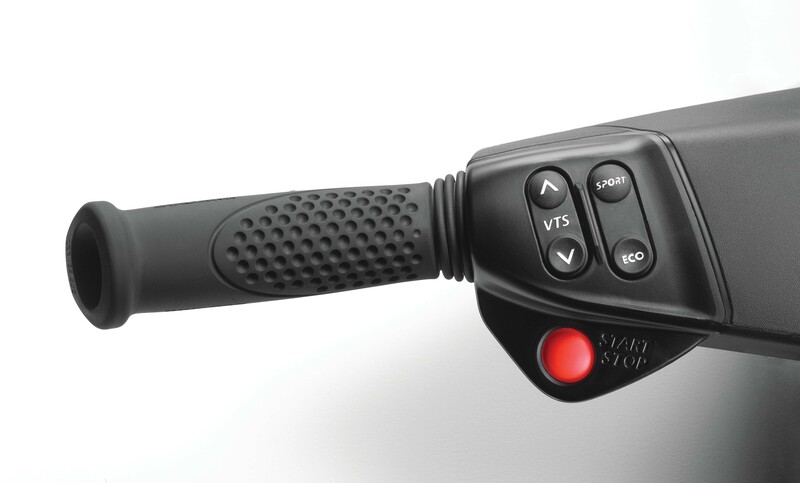 My confusion started when Sea-Doo introduced its exclusive iControl technologies. Suddenly and unlike my old Sea-Doo’s, I couldn’t get my new one started. So I broke down and read the manual – and voilá! – I can now get started every time. To understand how the new starting works, think of it like this: previous Sea-Doo watercraft were an engine assisted by a computer. This meant that plugging in the DESS cord and depressing the red start/stop button would fire up the Sea-Doo engine and the computer would tag along in tandem. But iControl models are more like a computer assisted by an engine. This means that I had to learn to take care of the computer first, before it would enable engine starting. •I press the red start/stop button before doing anything else. This activates the computer, which signals “Welcome to Sea-Doo” on the centre of my gauge cluster. •I promptly plug in my DESS cord. If it’s on properly, I hear two beeps. •I depress the red start/stop button again – and bingo! – I have ignition. No other order or combination works, so I memorized this one. I also learned that I don’t have to do this every time to start my new Sea-Doo. If I have been riding already and want to shut down briefly, I keep the DESS plugged in and turn the engine off by depressing the red start/stop button. Because the computer remains active for about three minutes after engine shut off, I have that window of time to get my Sea-Doo started up again using only the red start/stop button. The folks at Sea-Doo addressed my reluctance to read manuals. Today, new Sea-Doo’s come with not only a great manual, but also a waterproof, quick facts card that briefly summarizes key and basic operating info we need to know. But believe me, I get far more out of my 2013 Sea-Doo watercraft now, after having read the manual carefully than I ever did before. So my best advice to new Sea-Doo owners is learn your manual. You’ll be glad you did. Talk to you next time! 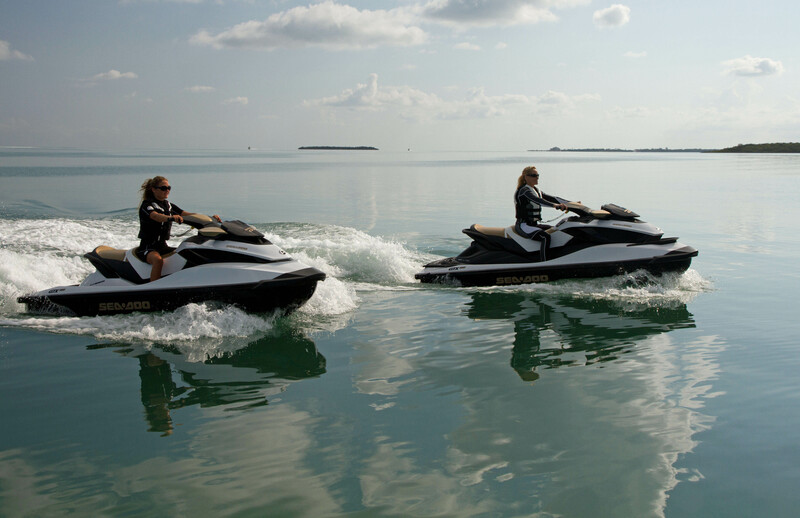 Sea-Doo watercraft are easy to tow and launch. I hardly know I’m towing a single bed PWC trailer, even behind a family sedan. Towing two Sea-Doo watercraft isn’t much different. Both one and two-bed PWC trailers don’t restrict rearward sightlines like towing a large boat does – and I can keep an eye on the watercraft and covers with my rear view mirrors. Securing the front of my Sea-Doo watercraft is a snap with a Move trailer, but it’s also relatively easy with a standard one, using the hook and winch. At the back, I use high quality tie downs, criss-crossed to fasten my Sea-Doo watercraft to the trailer. Then I cover up with a perfectly fitted Sea-Doo cover to protect my watercraft from dirt, bug splats, stone chips and prying eyes. Launching my Sea-Doo watercraft is also easy. If I have it, I slip my tow vehicle into 4-wheel drive at the launch. Before launching, I unplug the trailer’s electrical hook up and check that the watercraft drain plugs are tight. I always start my Sea-Doo watercraft briefly on the trailer. I don’t leave them running long to prevent engine damage, but this quick check helps ensure that I’m not launching a malfunctioning watercraft (making it much more difficult to re-load). It also serves to make sure I have the DESS cord(s) handy before I launch. Before I back in, I get out and do a quick visual inspection of the launch area, including under water, checking for bumps, cracks, obstacles or any other irregularities that might prevent with a smooth launch, damage my Sea-Doo watercraft or tow vehicle, or interfere with re-loading onto my trailer later. I pay special attention to the steepness and surface of the launch, as an unexpectedly sharp decline or slippery surface can make getting in and out more difficult. I also note the water depth to ensure my Sea-Doo watercraft will float free without my having to back halfway across the lake or inadvertently flood the inside of my tow vehicle. At one too-shallow launch, I had quite a workout manhandling the Sea-Doo watercraft off the trailer! Tip: I’ve bent several low hanging trailer licence plates while launching and even lost one, so now I remove the bolts holding the plate stiffly in place. Instead, I affix it with very heavy-duty zip ties so that it swings and moves out of the way when hit. For a two-person launch, I remove all the rear tie downs before backing up until the trailer is on the launch, but not in the water, and then unfasten the front hook from one unit so that watercraft is no longer attached to the trailer (with a Move trailer the front fastener is released by the rider while on board). My companion then climbs aboard the loose watercraft without getting wet and I back in far enough that it floats free so the rider can start up, back out and dock it. If there’s a second watercraft, I pull ahead and repeat the process. If I’m alone for the launch, the process is much the same, except I use the front mooring line to tie the loose watercraft to the trailer so it doesn’t float way before I can get back to it. Then I either climb on and back it away or simply walk the watercraft free of the trailer from dry land using the mooring lone (one reason why it’s important to have a long one). 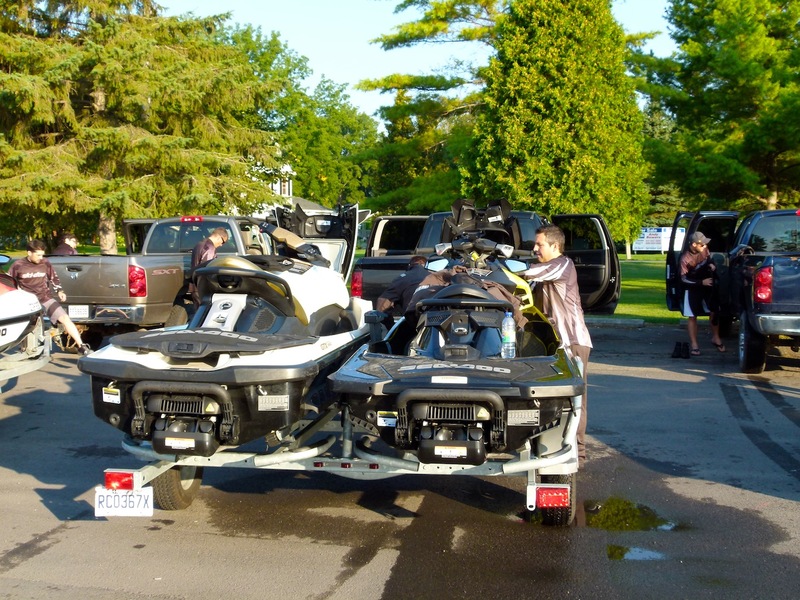 To re-load my Sea-Doo watercraft, I basically the reverse process, first ensuring that the trailer bunks are in the proper position, and then driving the watercraft on and making sure each is properly settled and centred. I re-fasten the front hook(s) (automatic on Move trailers) and pull out of the water to put the rear tie-downs in place. It’s important to for me to remember to re-connect the trailer electrical hook up and go back to 2-wheel drive, before driving away. One final launch tip: go slow and easy at every launch. Having burst a tire pulling out too fast and seen one guy drop his improperly secured watercraft on a concrete ramp (ouch!) when the trailer jerked ahead, I’ve learned that easing into and out of the water slowly is a much safer way to go. Happy towing and launching! 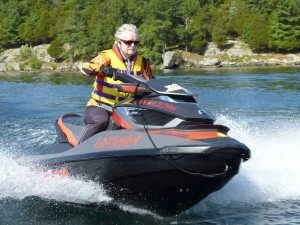 If you’ve never owned a personal watercraft and don’t know much about them, this blog is for you. 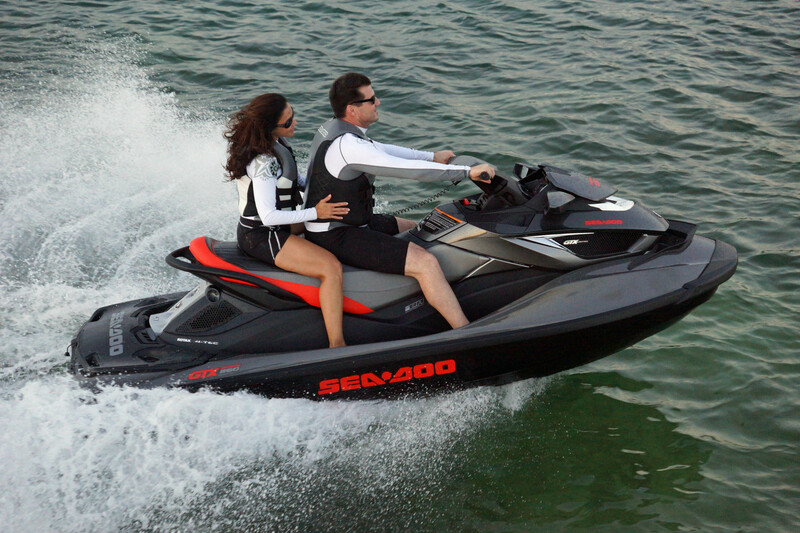 Sea-Doo watercraft from BRP are jet-propelled boats that operate much like a motorcycle or snowmobile. They provide the same exhilarating sensation of skimming over a surface and being able to go almost anywhere. Virtually unsinkable, family-friendly and completely reliable, an advanced technology Sea-Doo watercraft is easy to operate, with unmatched handling and turn-on-a-dime maneuverability. So it’s time for you to go shopping. You’ve already made a good choice by visiting Sea-Doo’s On Board Blog, so now familiarize yourself with available models and technologies on the Sea-Doo website. Then it’s time to hit the pavement. 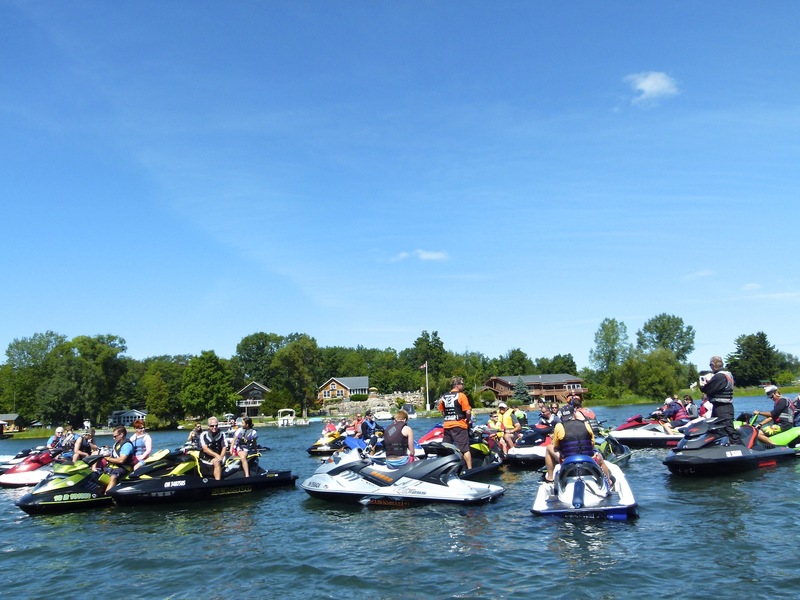 BRP sells Sea-Doo watercraft through its own global dealer network, much like automobile manufacturers do. 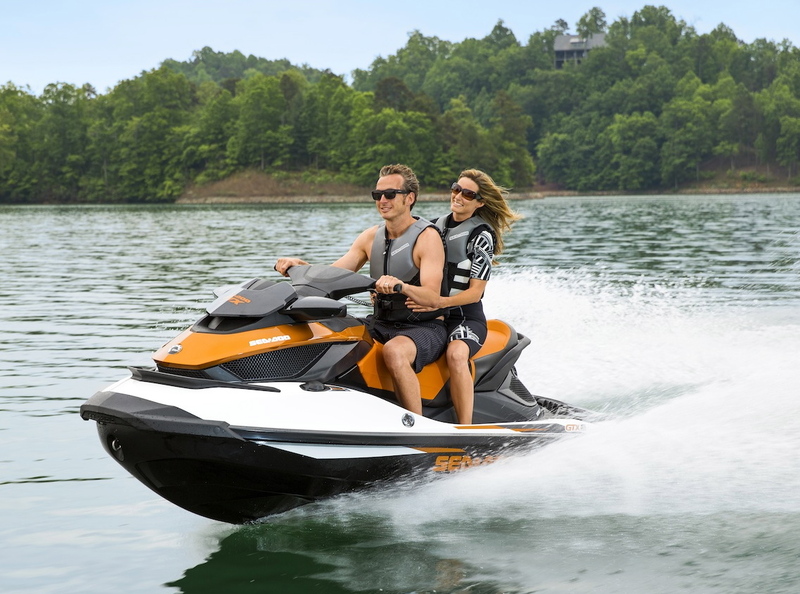 Sea-Doo dealers are not only very knowledgeable about Sea-Doo watercraft, they also offer parts, service, storage, trailers and accessories galore. Yes, your Sea-Doo dealer can outfit you with everything from PFD‘s (Personal Flotation Devices) and wetsuits, to covers, dock ties, bumpers and anchors…plus an array of colourful inflatables for towing the kids. Want to try before you buy? 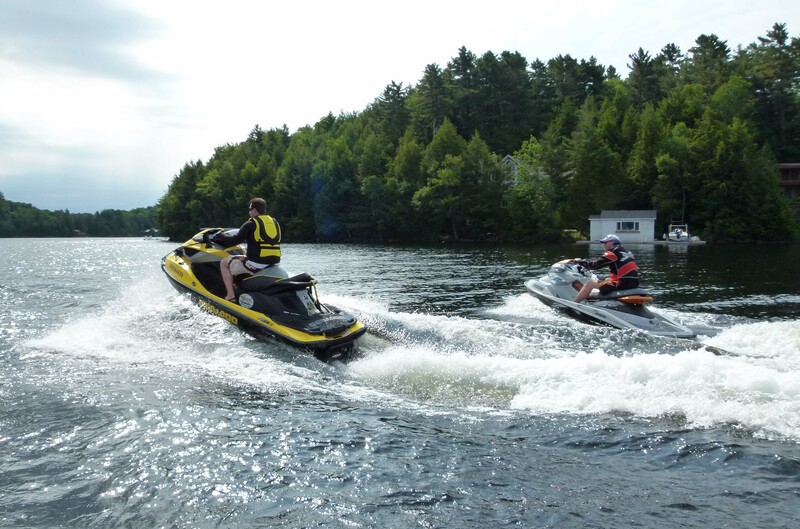 Some dealers rent Sea-Doo watercraft, while others have demo units you can arrange to sample. Tracking down a rental outfit may be a bit of a challenge, but start by asking your local dealer or googling “PWC rentals”. 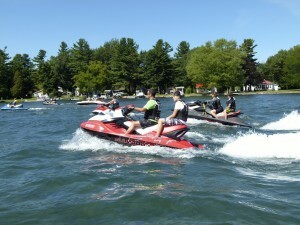 BRP also offers demo tours each summer. Many dealers, all over the US and Canada, are participating in the Try a Sea-Doo program this summer where you can make an appointment at the dealership and they will let you test ride their Sea-Doo watercraft. Once you climb aboard your first Sea-Doo watercraft and go for a ride, I guarantee you’ll want to try it again! 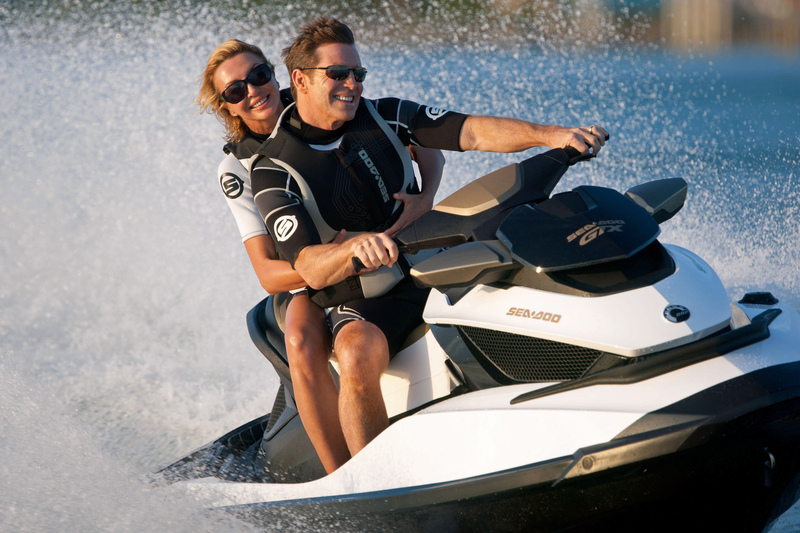 Who Will Be Riding Your New Sea-Doo Watercraft? If it’s intended primarily as a family-friendly watercraft, then it needs to be versatile, flexible and easy to ride for all skill levels. Will it frequently or seldom be used by multiple riders (operator and passenger(s)? Do you have lots of friends and guests who might also be using it? But if you think the primary use is for adults to go cruising and do some exploring, then that’s another thing. Maybe the purpose of your new acquisition is to keep your tow sports happy teens entertained. Or could it be that you’re a performance buff who’s looking for new thrills on the water. Of course, the reality is that it’s often a combination of the various “who’s”, but try to nail down a hierarchy that snapshots your present situation, including factors like experience, gender, weight, age and availability. 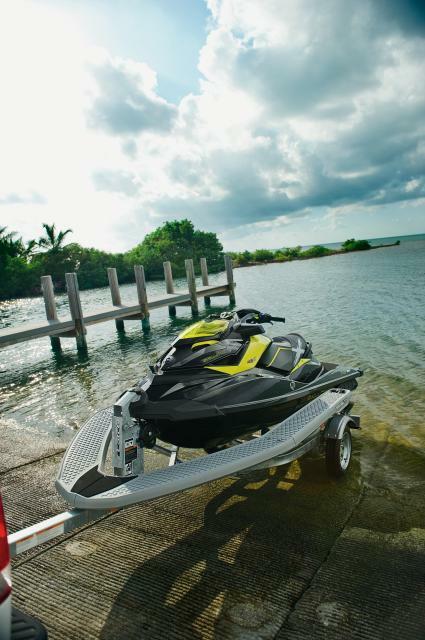 What Will Your New Sea-Doo Watercraft Be Used For? The answer to this one falls naturally out of your “who” answer, but also think about the “what” separately. What can a Sea-Doo watercraft do? What are the specialties of each specific model? What uses are you most beneficial to you? What if you or members of your family are really into tow sports? How might your “what’s” change over the next couple of years as ages, interests and priorities change? Where Will Your New Sea-Doo Watercraft Be Used? Fresh or salt water? Big water or sheltered back channel? River or lake? Always on your own lake or primarily on other waterways – or a mix of the two? If your home waters are navigable and interconnected with adjacent waterways, will you want to go exploring? Your “where” will help you determine which model best suits you. How Much Can You Afford to Invest in Your New Sea-Doo Watercraft? For me, this question breaks down into: “What can I afford now?” and “What can I afford for tomorrow?” After years in powersports, I’ve found that it always pays to invest in the best technology available today because I’ll enjoy it longer and get more for it on resale. It’s also interesting to remember that that unlike with other new boat transactions, Sea-Doo watercraft are all-in-one priced as an integrated, turn-key package including its purpose built and perfectly matched 4-stroke Rotax engine (instead of boat and motor from different manufacturers). The logic of good answers to these questions should make your Sea-Doo watercraft shopping easier and more cost-effective. Hopefully, it will also make dazzling colours and appealing graphics less of a distraction! Riding in the rain isn’t something I choose to do. But sometimes on long day-rides or tours it’s unavoidable. Before setting out on my Sea-Doo watercraft, I carefully and frequently check the marine forecast and weather radar for the specific riding area. If the probability of precipitation is 40% or more, we either change the time (ride earlier, later, shorter) or location of the ride. If there’s much chance of thunderstorms or we can’t change the ride, we cancel. Still, we get caught occasionally. The face is very vulnerable and rain also makes it harder to see. Wearing a ball cap and glasses or Sea-Doo goggles certainly helps, but the best bet is a facemask. Often worn by anglers in high-speed bass boats, these lightweight, plastic shields slip easily over your face to provide full coverage and have a polycarbonate lens to see through. For 2012, BRP Envinrude sells a good one. Alternatively, a neoprene facemask made for snowmobiling will also work. With no pain to distract you, riding in the rain can actually be fun, provided you can see well enough and there’s no thunder and lightning. But you’re likely going to get wet. So the big deal is to stay warm. Warm and wet is fine. Cold and wet is miserable. Once again, my long sleeves and pants help to keep me warm by breaking wind contact with my skin. The Sea-Doo Men’s Neoprene Riding Jacket will help hold in body heat. The good news is that most unexpected summer rains dissipate quickly and the sun soon returns to dry you out. Talk to you next time!